Common in home construction in Canada and the United States, 3 tab asphalt shingles are a basic, reliable choice for steep slope roofing. With the look of three individual shingles, 3 tab asphalt shingles lend a clean, two-dimensional look to a steep slope roof. 3 tab asphalt shingles for steep slope roofing systems are made of asphalt layered onto fiberglass, cellulose or other organic materials. Minerals are embedded into the asphalt to add dimension. Though cost may vary, 3 tab asphalt shingles are among the least expensive shingles available for steep slope roofing. 3 tab asphalt shingles, available in a variety of colors and textures, can add architectural interest to your home. 3 tab asphalt shingles used in steep slope roofing applications often require specific materials to be used alongside them to ensure maximum effect. 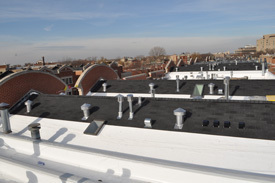 They include underlayment to protect the deck until the shingle is laid and to discourage moisture build-up later; 11-gauge or 12-gauge galvanized steel fasteners or roofing nails; and metal flashings. 3 tab asphalt shingles for steep slope roofs generally are rated for 60 mph winds. The most common 3-tab shingle will come with a 25 or 30 year warranty.